MUMBAI (AFP) - Topping anything in hit film Crazy Rich Asians, the only daughter of India's richest man ties the knot on Wednesday (Dec 12) after days of lavish celebrations that included a Beyonce concert at a lakeside palace. Ms Isha Ambani, whose father is tycoon Mukesh Ambani, was set to wed Mr Anand Piramal, son of Indian billionaire industrialist Ajay Piramal, in the Ambanis' 27-storey home in Mumbai. Days of pre-wedding festivities at a sprawling palace in Udaipur in the desert state of Rajasthan included a concert by Beyonce, purportedly the bride's favourite singer. Attendees included Hillary Clinton, former US secretary of state John Kerry and dozens of Bollywood stars, including Salman Khan and Aamir Khan, as well as cricket superstar Sachin Tendulkar. Joining them was a who's who of India's super-rich elite, arriving on dozens of specially chartered flights into Udaipur's normally sleepy airport and whisked away in expensive cars. Actress Priyanka Chopra and American singer Nick Jonas, who themselves became husband and wife earlier this month, were also guests at Udaipur's City Palace on the banks of Lake Pichola. Wednesday evening's actual wedding was set to be a more private affair with around 600 close friends and family, and some politicians, expected to be on the guest list. There was a high police presence in the south Mumbai area around the Ambanis' home, which is called Antilia and reportedly cost over US$1 billion (S$1.37 billion) when it was completed in 2010. 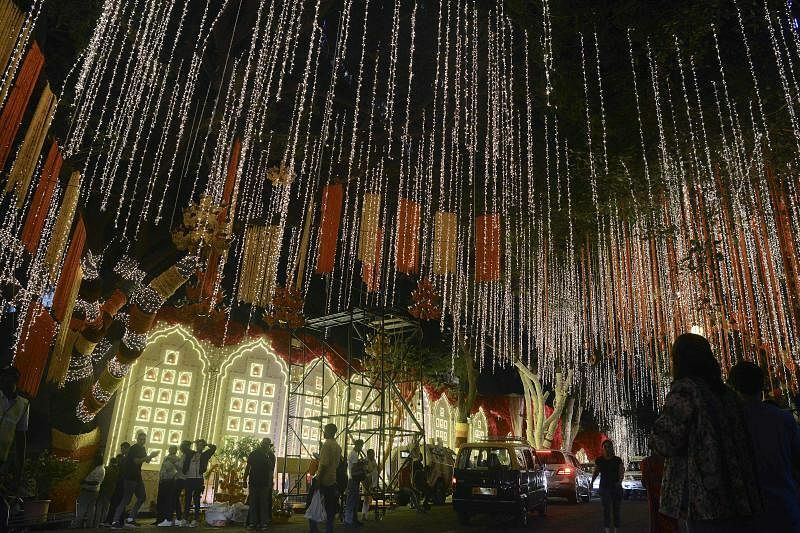 Indian newspapers have been abuzz with speculation about the total cost of the wedding. Conservative estimates have put it at around US$15 million while others insist US$100 million is closer to the truth. Ms Ambani, 27, and Mr Piramal, 33, got engaged at Lake Como in Italy in September and the high-profile wedding brings together two of India's biggest industrialist families. Mr Mukesh Ambani is the chairman of oil-to-telecoms conglomerate Reliance Industries. He is worth more than US$47 billion and recently overtook China's Jack Ma as Asia's wealthiest man. The respective families will hold several other receptions across India's financial capital in the coming days. The wedding caps a big month for what social media users have been calling "big fat Indian weddings". The Chopra-Jonas nuptials came shortly after Bollywood stars Deepika Padukone and Ranveer Singh wed.
"Isha Ambani's wedding is a perfect example of the wealth inequality in India," wrote one Twitter user. "Here you have one of the richest families in the nation spending so much while millions still can't even afford food or shelter," she added. "The new standard for a lavish Indian wedding is Beyonce. Imagine," tweeted another.